Might as well just accept it. 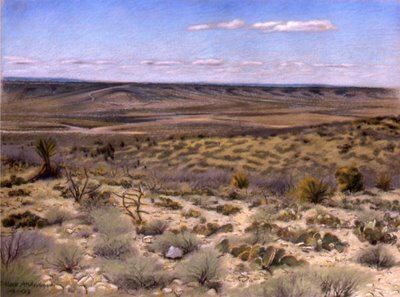 The pastel landscapes displayed on my website (www.andersonstudiowork.com), the beautiful ones as well as the junky ones, were all done in or near Carlsbad, New Mexico in the spring of 2003. Carlsbad has a plethora of junk as well as beauty. The pictures were all drawn on site; in fact, they were all made from the shelter of a tiny Honda Civic. "Living Desert" shows the landscape on the city limits of Carlsbad. "El Capitan" and "Hunter's Peak" were drawn in Guadalupe National Park, which is in the northwest corner of Texas, about 70 miles southeast of Carlsbad. El Capitan is over 9,000 foot tall and is part of an ancient exposed reef. It was very windy while I was drawing. The car was rocking and uprooted vegetation was blowing past. I do work from photographs, but I don't copy them. They need to be interpreted. The best thing, though, is to be outside, in front of the real thing. "En plein air" as they say. Silverton is an hour south of Portland, Oregon. After a solid August of hot sunny weather, thunderstorms rolled in on the first day of the festival. The artists scrambled to cover their work with plastic and batten the hatches while patrons ran for cover. Fortunately my booth was on a slight rise, but some of my neighbors were not so lucky, and their tents were soon resting in shallow bodies of water which the hard baked ground would not accomodate. As novice festival vendors we clumsily scrambled to remove the more vulnerable pictures to our truck, and address the growing reservoir of water collecting on one corner of the tent roof. The pictures were saved from damage, but I managed to soak myself. The second day of the festival brought sunny and clear weather by the afternoon. In spite of everything, we had a great day. Oregonians are a resilient breed, well adapted to their aquatic environment.